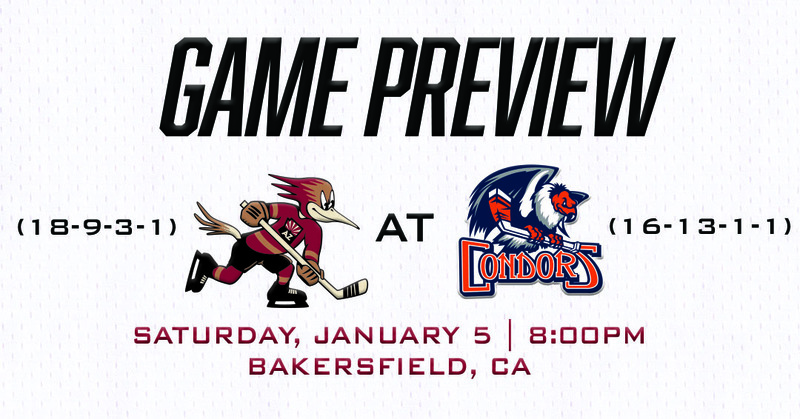 The Roadrunners make their third visit of the season to Bakersfield’s Rabobank Arena tonight in an effort to earn their third win of the year against the Condors, having taken the teams’ two previous meetings this season by 2-1 count on October 13 and a 6-1 score on November 24. The Condors, vying to maintain pace with the fourth and final playoff spot in the Pacific Division, have not been helping their own cause of late, dropping five of their last six contests (1-3-1-1). Bakersfield is a flat .500 (8-8-1-0) on home ice this season at Rabobank Arena. It is presumed Hunter Miska will make his 16th start of the season after serving as Calvin Pickard’s back-up last night. 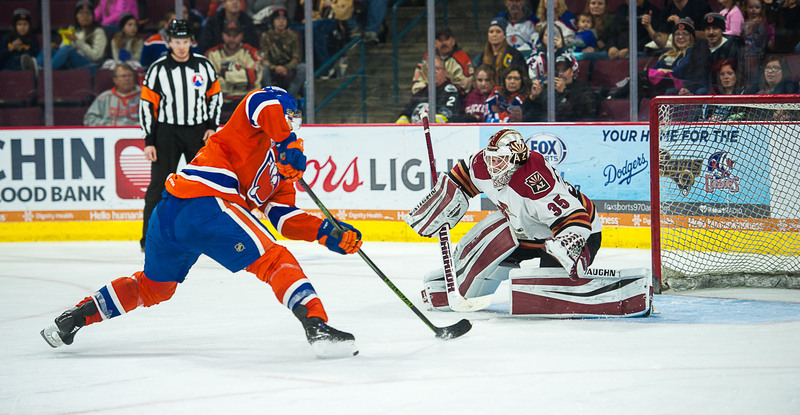 Miska stopped 28-of-29 shots faced on November 24 at Rabobank Arena, helping the Roadrunners to a 6-1 win over the Condors. The Roadrunners are 6-6-1-0 this season on zero days rest, including a 3-3-1-0 mark when playing the second half of a back-to-back on the road. Entering the night, the Roadrunners remain one of three teams without a player to have hit double-digits in goals scored; the Rockford IceHogs and Ontario Reign the two others. Lane Pederson, who netted Tucson’s seventh and final goal last night, comes into the evening’s affair with nine on the year, as do Adam Helewka and Hudson Fasching. Fasching (2G, 1A) and Helewka (1G, 2A) lead all Roadrunners players in scoring against Bakersfield this season, credited with a combined three points apiece. The Roadrunners have outscored opponents by a combined 109-97 margin through 31 games this season, a plus-12 differential. The team’s average of 3.52 goals score per game ranks in at eighth in the American Hockey League. WE LIKE IT HERE: Dating back to their inaugural season, the Roadrunners have had much success at Bakersfield’s Rabobank Arena, posting a striking 8-1-1-0 record on the road against the Condors, including a 2-0-0-0 mark this year. They’ve earned 17 of a possible 20 standings points during their all-time visits to Bakersfield. REVITALIZED: The Roadrunners have capitalized on the power play in five of their last six games, and scored a season-high three goals on the man advantage last night in Stockton. Nick Merkley, who factored into all three of Tucson’s power play markers Friday, has been a huge part of the club’s special teams rebirth. Six of Merkley’s nine points registered in his eight games played have come on the power play. GETTING INVOLVED: Forward Giovanni Fiore found the score sheet for the first time in a Roadrunners uniform last night, registering his third multi-point game of the season with a goal and an assist, including the game-winner. Fiore has one goal in two games played against the Condors earlier this season as a member of the San Diego Gulls. TWO-HUNDRED FIFTY: The Roadrunners' first goal tonight will serve as the 250th road goal scored in club history. With a franchise 510 goals scored since the start of the 2016-17 season, 249 have been netted in opposing buildings. Tucson has outscored its opponents 510-507 all-time and 261-254 at home, but have a minus-four road differential (249-253).